Successfully Added HK Warehouse Ulefone Metal Android Smartphone - Android 6.0, 5 Inch Display, Octa-Core CPU, 3GB RAM, Dual-IMEI, 4G, OTG (Silver) to your Shopping Cart. The Ulefone Metal lets you enjoy all media and the latest features of the mobile industry in stunning detail. With its powerful hardware and beautiful 5 inch HD display this phone delivers an exceptional user experience. This sleek Android phone runs on an Android 6.0 operating system that is guaranteed to offer a smooth interface that supports all your mobile demands. Placed in its stylish body lays a 5 inch IPS display that portraits all media in breathtaking quality. Delivering vivid colors and highly detailed images the Ulefone Metal truly lets you enjoy a cinematic experience from the palm of your hand. Featuring a 64bit Octa-Core CPU and 3GB of RAM this Chinese smartphone is a real power horse that is capable of smoothly running the latest Apps, demanding games, and HD movies without slowing down the device. Supporting the possibility to add 128GB of external memory leaves you with plenty of storage space for you to save all your files, media and more – ensuring that you’ll always be able to carry along numerous files and hours worth of entertainment within your pocket. Thanks to its massive external storage space and powerful hardware this Android smartphone is the perfect device for professional multi-tasking and entertainment purposes alike. Supporting Dual-SIM and IMEI numbers this Chinese phone offers you the possibility to be connected to two providers simultaneously. This makes the Ulefone Metal the perfect smartphone that can be used to efficiently separate your work and private life. With 4G connectivity this Android 6 Phone provides you with the fastest mobile data speeds out there, allowing you to browse the web in lightning speeds. 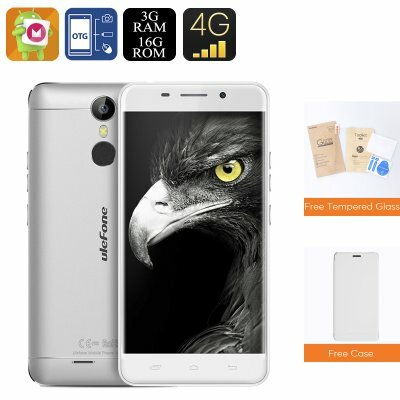 Downloading files, streaming HD movies, or playing online games – with this smartphone you will undergo a smooth online experience without encountering any lag or other interruptions. With its epic SONY 3050mAh lithium-ion battery the Ulefone Metal provides you with up to 8 hours of continuous usage time – enough to get through a day filled with mobile entertainment and phone calls without ever needing to worry about battery life. Its OTG feature additionally allows you to connect external hardware such as keyboards or USB sticks to your smartphone, further enhancing your overall user experience.